It's funny to think that men who are very fit, and who are fanatics about going to the gym, and who take good care of their bodies but have neglected their faces. Thank God that's changing fast. 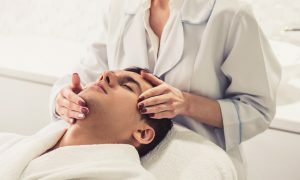 More and more men are visiting spas for treatments and that includes facials. According to a study from the International Spa Association stats show that the percentage of men going to a spa has risen from 31 percent to 47 percent in less than a decade, so it's no longer a question if it is acceptable for a man. And it is totally worth it to let the esthetician assess your skin and customize a personalized facial and perhaps even a skincare regimen to help your skin look and feel its absolute best. Visiting a spa for regular facials is your best choice to keep your skin rejuvenated, and smooth and moisturized, free of breakouts and blackheads and blemishes. And aside from those benefits, men are very much aware of the fact that they too need to take care of themselves and enjoy their time of relaxation, away from the hustle and bustle of daily life and stress. 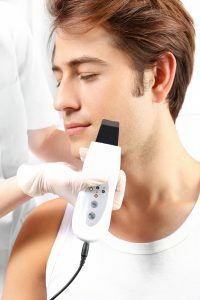 Our man facial includes cleansing, exfoliation and extraction and/or microdermabrasion to remove dead skin cells and blackheads, and a mask, depending on the type of facial and concerns you have. We may use ultrasound and also recommend an LED light therapy to improve your skin tone and overall appearance. Then we finish with a serum and hydrate your skin with our organic stem cell skin care products. And rest assured, each treatment is gentle enough that you can go back to work without anyone noticing that you just had the best facial for men. Please do not shave the day of your facial and do not wash your face or hair after the treatment until the next day. We recommend that you cleanse your face twice a day, morning and night with good cleanser, and hydrate your face with a suitable serum and/or cream, and apply an SPF30 every morning and come for regular facials to keep your skin in top shape. Cleanse your face thoroughly at night and dry your face, then apply a serum and or night cream to dry skin. It's important to cleanse at night to remove all the dust and pollution we are all exposed to during the day, and because the skin cells renew themselves at night. So it is super important to go bed with clean skin. What Type of Facial Should You Book? Depending on the results you want, and how long ago you had a facial, our Ultimate Anti-Aging Lifting Facial is the most advanced and most popular facial for men and women of all ages, and your next best choice is our Signature Facial. We can discuss this once I assess your skin, but please just make sure that you have 90 minutes set aside for this facial treatment.